Here at SGS PSI, independent testing is what we do. Our expert scientists face complex testing problems and engineer custom solutions to meet and exceed our clients’ needs. From chemical analysis to physical testing, our laboratory is equipped to handle a wide range of testing needs. We are a group of curious and innovative scientists, always looking to add to our capabilities. We strive to obtain the best possible equipment so we can deliver for our clients in a timely, results-driven, and necessarily accurate way. That’s why we’re proud to announce the addition of an IZOD Impact tester to our physical testing lab. We thought we’d take some time to explain Impact Testing and the implications it has for serving our clients. When we think about physical testing, we sometimes consider things like dimensional analysis, density, or tensile strength. Measuring these properties, we can learn a lot about a material and understand why a failure or manufacturing defect occurred. Impact testing is a different sort of physical test. Impact tests use a pendulum system to apply a force to a material in order to determine impact energies. Determining impact energies is a crucial step for quality assurance, compliance, and specifications analysis. This impact test can also be used to compare passing versus failing batches of a product and is just one of many important tests we utilize to examine why failures occur. Our impact tester determines the impact energy of neat or filled, rigid or semi-rigid polymers. 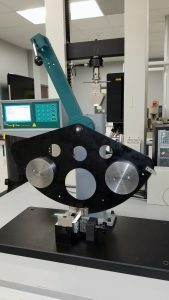 The test is performed by applying a known force to a notched or un-notched sample. Our lab has the equipment to properly notch specimens in-house and conforms to ASTM Standards D4812, D256, and D6110. “Izod” and “Charpy” are the two primary test modes for pendulum impact tests. The difference comes down to how the methods support a material: Izod uses a bar that is about 2.5 inches long and is held vertically in a vise. The hammer strikes near the top. Charpy uses a long bar and is supported horizontally. The hammer strikes the test specimen at its center. The Izod test (ASTM D256) uses a notched specimen. ASTM D4812 is essentially the same test with no notch in the specimen. 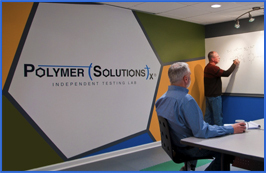 There are many reasons why we test a polymer material using this method. Impact energy values are useful when testing degradation due to age, environmental exposure, or chemical contamination. Often, physical properties like strength, durability, toughness, and impact resistance can be reduced even if the product appears unchanged visually. We’re very excited to offer Izod impact testing to our clients who require timeliness and world-class accuracy. Our independent testing labs test products that are manufactured worldwide by a variety of industries. Because we can offer another capability to our clients, we are better able to better serve the complex industries we work with everyday. From failure analysis to aging studies, we’re equipped to inform our client’s physical testing needs, whether a test requires a short turnaround, months, or even years of study. Adding one more physical testing option to our scientists’ analytical toolkit allows us to continue to offer world-class testing. The SGS PSI team can help answer your most complex material questions. Call us today!